Whether you call it Rosary Vine or String of Hearts, you'll be captivated by this charming house plant. Pairs of heart-shaped leaves grow about every 3 in (8 cm) along the slender stems. Decorative all on their own, the leaves are splotched with a lacey pattern of white on the top and are purple underneath. 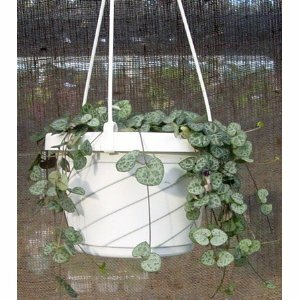 Display it in a hanging basket to show off those long, heart-studded vines. Propagate your plant. Small tubers sometimes grow along the stems, causing the stems to branch out. You can remove the tubers anytime and set them on the surface of the soil to grow more plants in the same pot. Prune it back when it starts to look leggy. Propagating the stem cuttings by inserting them back in the soil will give a fuller display that's lush with leaves. Repot in spring when it gets crowded, moving to a pot only 1 size bigger. This vining plant grows from 2-inch (5 cm) tubers. Place them on the surface of the soil. Use a sandy mix and a pot with a drainage hole to avoid soggy soil, which can cause the tubers to rot. This carefree classic beauty was once an extremely popular indoor plant, but not as common these days. Perhaps it has fallen out of favor because it is so easy to grow? Somehow easy-care plants get less respect. If you come across this beautiful succulent vine, buy it. It's long-lived and easy to propagate for more plants. You may find rosary vine for sale at online nurseries or at your local garden center. It may be labeled by its genus and subspecies names, Ceropegia woodii. Light: Keep your plant in bright light (with some direct sun) for best color and plenty of leaves. Long spaces between leaves are a sign it's not getting enough light. Water: Keep the soil lightly moist in spring and summer. Water sparingly in fall and winter. A semi-succulent, this plant is more tolerant of dry soil than wet. Humidity: Moderate (around 40-50% relative humidity). If indoor air is dry, use one of these easy ways to increase humidity for your houseplant. Soil: Mix 1 part good-quality potting mix and 1 part sand or perlite for fast drainage. Propagation: Take stem tip cuttings and insert cut ends in moist soil. Or cut off stem tubers and place them on the surface of the soil.